Since the game was not until 6pm, Ken and I enjoyed the peaceful surroundings Saturday morning. Coffee under the awning moved about 20 feet to coffee on our little section of beach. Mid-afternoon we drove through rain the 40 miles to the stadium. The clouds were still threatening as we arrived but luckily stayed to our north. We were pleasantly surprised at the size of the stadium, considering the size of the school, and how easy it was to find parking. 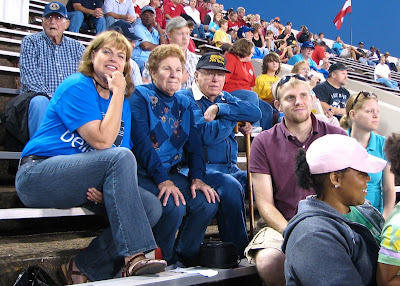 My sister Betty and her husband Chuck drove down from Quincy for the game since Clarksville is also where Betty’s grand-daughter, our great-niece, Brandi lives. The Panther Club tailgating participants gets more sparse as we get farther south but they guys did a great job with plenty of refreshments and chicken on the grill. Betty and Chuck had spent the morning geo-caching in Clarksville and they educated Doc Rudert, Ken and I on this ‘addiction’ they have. They have located over 1820 geo-caches to-date. The closest was the last one they’d just found right here on campus at the art building in one of the sculpture exhibits. Apparently there are currently some 300,000+ geo-caches hidden globally. I guess this hobby will keep them busy for awhile! 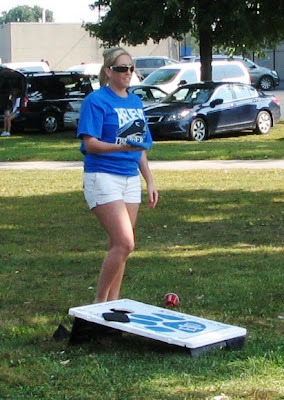 By game time, Brandi and her husband, Dominic, had joined us. We won the game 30-20. Unfortunately, the nighttime lighting has once again thwarted Ken’s attempts at actions shots. And there was one action shot that would have been priceless. Trevor got an interception!! It’s not too often you get to see the ball in the hands of a big lineman. Trev didn’t get too far with the ball because he came down with it in a crowd but it was pretty awesome to watch. While we won, it wasn’t one of our better showings and we will definitely have to play much better next week if we are going to have a chance against division top-rated Eastern Kentucky next week. Trevor and team came over to do their victory song. See Sandy, Kevin does sing along and Mike and Louise, since you didn’t appear to get to make the game, you can at least see that Gordy was still looking in good shape by the end of the game and did a great job causing a fumble when the other team was inside the 25 yard line. The guys had to come over to say ‘hi’ to us in the stands since apparently the sewer backed up in their locker room and they were going to have to be moved to a different locker room on campus for showers. It's Sunday noon now and I'm sitting in the Dover McDonald's using my $2.97 Internet time to do this post and check emails. 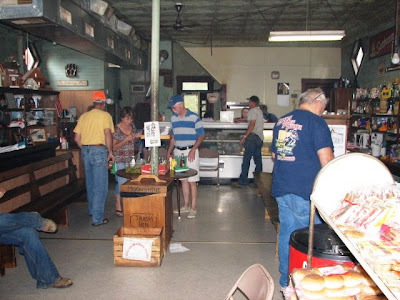 I need to keep moving though since I need to drop by the Piggly Wiggly and pick up some groceries and then get back to the campground before Betty, Chuck, Dominic and Brandi come for an afternoon visit and early supper. Ken has promised to do housecleaning while I'm out....I think he likes having some private time, even if it means running the vacuum! 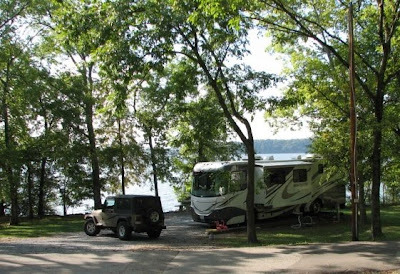 On Monday, Sept 21, we left Trail of Tears State Park and travelled to Piney Campground at Land Between the Lakes in Tennessee. 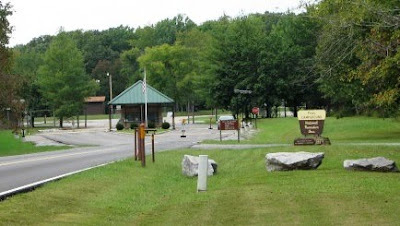 This is a huge campground with nearly 400 sites. At the check-in station we were informed that a rig had just vacated perhaps the nicest full hookup site right on the lake and so we snatched it up. We realize now that from a cost standpoint we should have done more study of our options. While we love our site and 50-amp and full hookups, we really don’t need all this. We had assumed since this is a national park we would get 50% off with the Golden Access pass like we do at COE campgrounds. Lesson learned: they only give $6 off regardless of type of site. This meant that we were sitting in the highest cost $32 site and were, therefore paying $26 a night. As it turns out, if we would have known it we could have instead stayed in one of the open 30-amp electric only sites with a water spicket nearby for only $12 a night after the discount. .
We certainly have no complaints about the site unless you consider not being able to get good digital television or cellular phone signals a problem. Of course, the closest wireless access is 12 miles away at the Dover McDonald’s. By the way, McDonald’s wireless is not free. It’s $2.97 for up to 2 hours use. 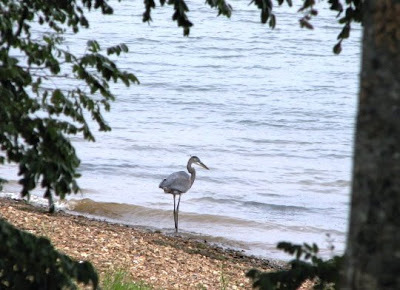 We apparently were sharing this site with a Heron who hunted the waters just outside our rig each morning. Ken named him ‘Harry’ and sat outside each morning having his coffee with him as Harry showed off his expertise at catching his breakfast. To keep his health in check, Ken’s preference is to have a ‘down day’ after a travel day so we stayed close to the rig on Tuesday. 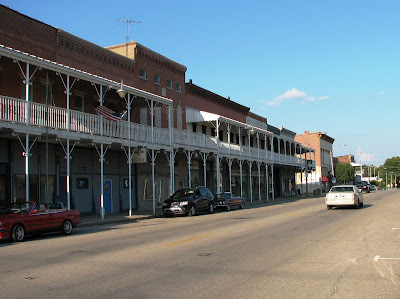 We dropped in to Dover for an email check, picked up a few items at the Piggly Wiggly and then Ken was drawn in by the call of the ice cream bars that they sell at the campground outpost so we had to stop there as well. 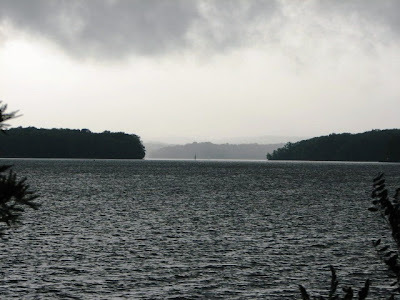 We were both mesmerized by the storm clouds rolling in across the lake and the way we could sit under the awning and watch the rain approach across the lake. 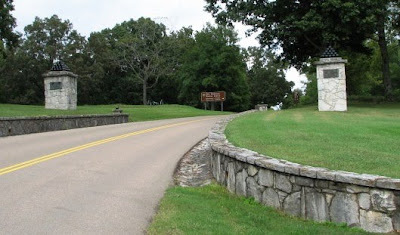 Wednesday we drove to the Fort Donelson National Military Park in nearby Dover, Tennessee. This is where the first major Union victory took place during the Civil War. 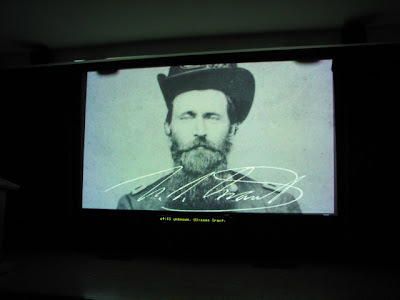 First we watched a 15 minutes movie at the Visitor’s Center describing the events leading up to the battle, giving background on the key leaders, explaining how the battle was fought on both rivers and land, and describing the surrender and its implications. We then took a driving tour around the fort. 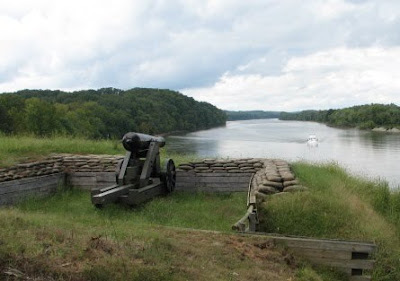 This gave a really good visual of why the Confederates actually won out against the Union gunboat fleet of 4 ‘IronSide’s with the 12 big guns in the Confederate river batteries. . 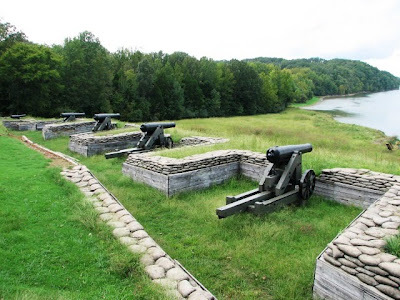 I have always envisioned forts with wooden or stone walls but Donelson was surrounded by large earthen embankments with trenches surrounding the outside. The rebels lost the battle on the ground, in the end, mostly because of some stupid mistakes and in-fighting between the various Confederate commanders when they nearly had that battle won. 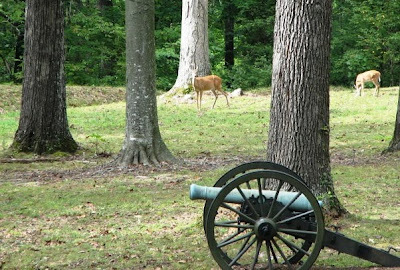 As we stopped at one of these lines of last defense we were joined by a doe and her fawns who apparently still live in the fort. I found this place to have a strange energy about it, considering that there were literally thousands of soldiers buried where they fell here. The literature describes this place as hallowed ground and you have that sense as you pass through it. 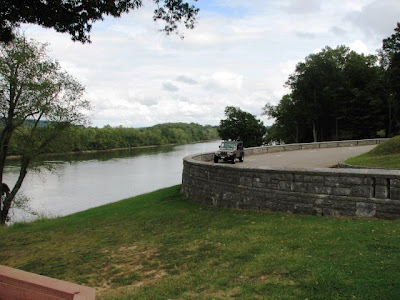 The driving tour also takes you outside the fort in to the town of Dover where the surrender was negotiated at the Dover Hotel. It’s most interesting to learn the ‘human side’ of this history. For example, General Ulysses S. Grant and surrendering Confederate General Simon Bolivar Buckner were West Point classmates and friends. Because of the tough terms put forth by Grant it is this battle that gained him the nickname “Unconditional Surrender” Grant. Nonetheless, Grant did not want to gloat over the Confederate situation and instructed “to move the whole line forward, and take possession of persons and property but without a word of taunt—no cheering”. Make shift hospitals were set up with the Union looking to the wounded on both sides. 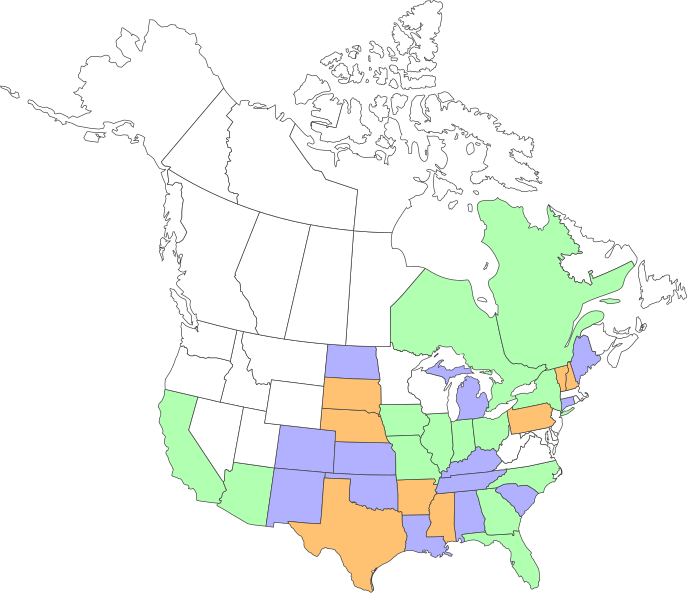 Another interesting point was that some of the 13,000 Confederate prisoners taken were shipped upriver to Springfield, IL. I did not know there was a prison camp in Springfield and now want to do more checking on that since we are regularly through Springfield in our travels. 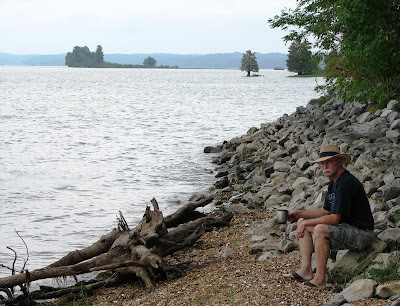 From Dover, we drove up ‘The Trace’, the primary highway in between Kentucky Lake and Lake Barkley. If you are looking for a tourist area with sites in close proximity this IS NOT it. 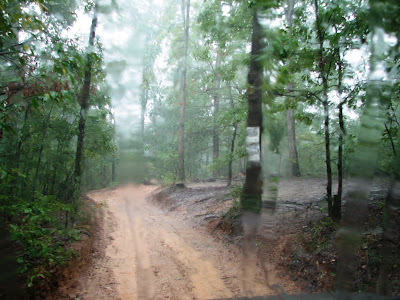 The LBL area is easily 40-50 miles long, with the attractions we were interested in 20 miles or more from our campground. 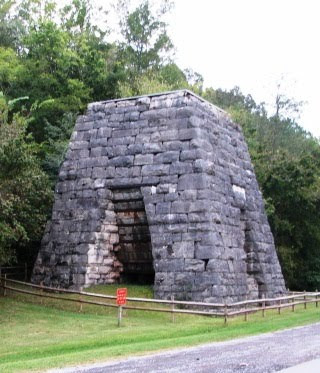 Along the Trace we stopped at the Great Western Furnace to learn a bit about this area and pre-Civil War iron production. 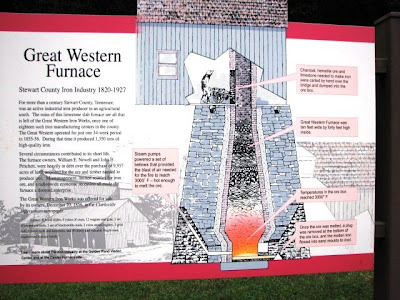 An interesting point in why this Iron Works did not produce for very long was that it was manned largely by slave labor and there was an insurrection of these workers, closing down production only 34 weeks after it had begun. Our final destination was the Elk and Bison Prairie since we were told this was best visited early morning or just before dusk. 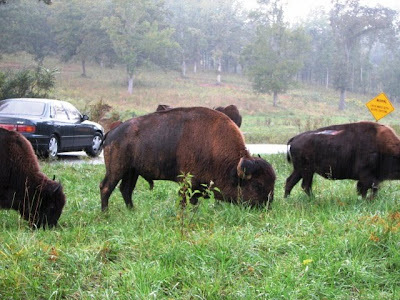 As we entered the park it began to rain, but the bison didn’t seem to notice. The Elk however were likely in the wooded areas and didn’t come out to visit. 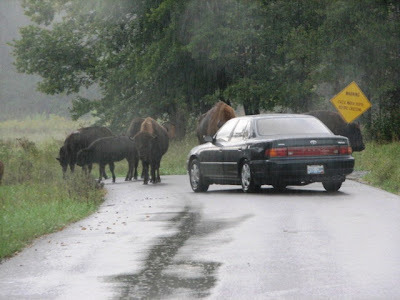 It was obvious we were in the bisons’ territory and they had no intention of ‘sharing the road’. We sat for quite a while just watching as they grazed all around us. 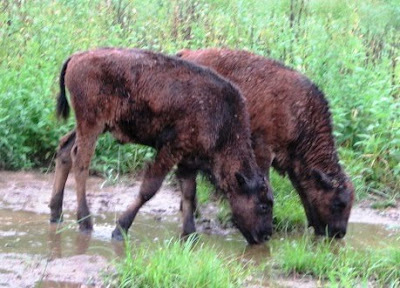 We were surprised at the number of young calves of varying ages. 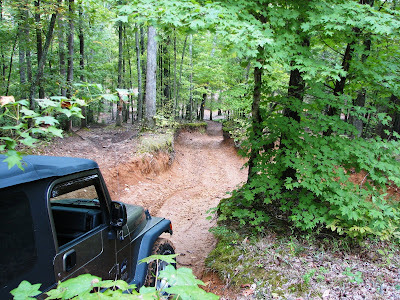 On Thursday we decided to follow the suggestion of a campground neighbor who also towed a jeep and try out the LBL Turkey Bay OHV (Off-Highway Vehicle) Trails . Ken called before we made the 20 mile trip to insure they were open since it had been raining off and on since we arrived at LBL. No problem – they were open, so we paid our $15 vehicle entrance fee (that actually was good for 3 days – darn, why didn’t we find this place sooner!) 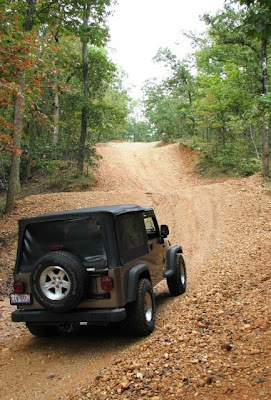 , buckled up and headed for the hills where there are over 100 miles of trails with various levels of challenge. We actually stayed on the easier trails although they have some really challenging trails where 4-wheelers and trail bikes could find some real excitement. Some of the trails took us along the lake. But most wound up and down the tree-covered hills. The pictures we took really don’t give a feel for how steep, narrow and winding some of these paths could get. I guess that’s because at those points I was holding on instead of shooting photos!! We had the place almost to ourselves except for a few 4-wheelers. 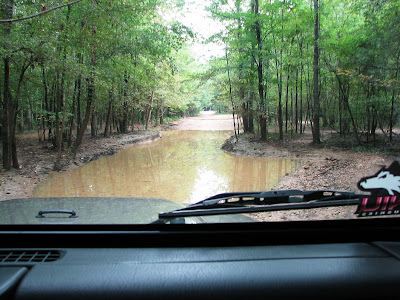 It was a jeepers paradise!! Suddenly, when we were at the farthest point from the gatehouse, the clouds left loose with the worst downpour we’ve seen in ages. As the brochure notes “Trail conditions are subject to change without notice”. Wow – what an understatement!! After the rain we had a whole new set of adventures spinning our way through mud pits that had just 15 minutes earlier been the easy parts of the trail. Ken did an excellent job of driving. There was this once he used a ‘controlled’ slide on a steep down-slope where after the rain we sort of slid sideways down a steep muddy slope rather than actually steering. He was actually more worried about getting out the other side which was steep and required he negotiate between a few boulders besides just make it up the slope. 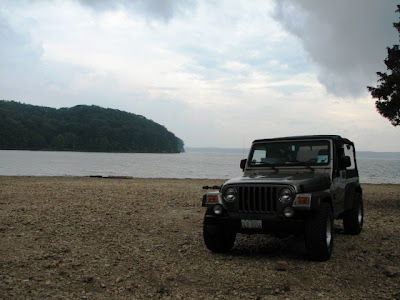 Jeep and Ken did a marvelous job with jeep showing no signs of abuse other than a lot of well-earned mud coverage. After 3 or 4 hours of playing we made our way back to the GateHouse and found it closed. Apparently they considered conditions too bad to stay open. We actually thought it turned out to be the perfect day for ‘mudding’ and had a blast!! Ok, so that’s it for our adventures between football games. Ken and I are using Friday as another down day. He always needs to rest up before game day when I think he gets as revved up as the players! 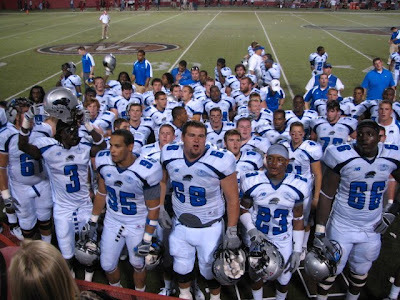 We’ll be back soon with the results of the EIU at Austin Peay game….6pm Saturday, 9/26. 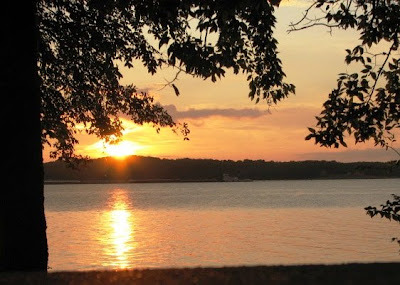 Signing off with a sunset view from our patio here at LBL Piney Campground as we watch the barges pass. First, we love to have ya’ll following our adventures and love your comments and questions so keep them coming. Jan, we love to hear from you and are hoping we will figure out a way to cross paths again in the near future. 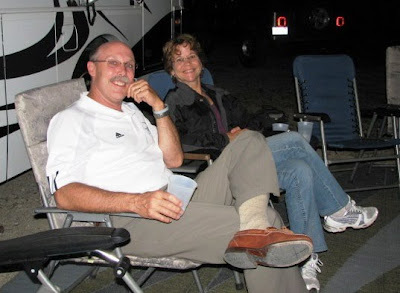 For the rest of you, when you see comments from Jan, she and her husband Wes were folks we met at the Life on Wheels Conference even before we had our motorhome. Jan does a great blog of her own following their adventures and you can reach it from our favorite links on the left side of this page. For the person who asked for more pictures…we’ll try!! We seem to forget to carry our camera lately at all the wrong times!! Regarding the anonymous question on what we plan to do once the boys have lives of their own….the boys really have lives of their own now. They haven’t lived at home for years but they know we are there for them when they want us around, like helping Kyle with his house or following Trevor and his football team. We come from environments where family activities have always been central and we are blessed that both our guys still feel strongly about that as adults. For example, one sticking point on going ‘full-time’ is how we would handle the Christmas holidays since the tradition of having family gatherings of aunts, uncles, cousins at our house is something both boys want to hold on to. It’s foundational and comforting to have some things remain the same when the rest of your world is always changing. In this same vein, we are not sure we are ready to sell the house. Ken designed the house on piece of graph paper when the boys were still too young to remember so it’s the only home they’ve ever known. So it’s more than just ‘sticks n bricks’ to the 4 of us. Once Trevor is settled with a job after college, it’s possible we might feel differently. We still have unlimited possibilities and nothing is set in stone – how wonderful to have such freedom. 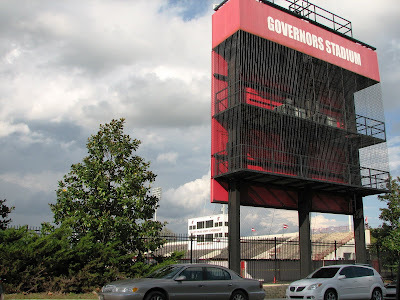 On Wednesday, Sept. 16th, we left Charleston, IL, on our way to Cape Girardeau, MO for Trevor’s next game against Southeast Missouri State (SEMO). 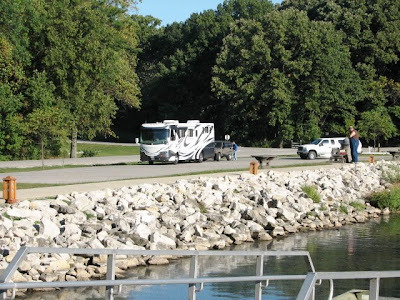 We stopped one night along the way at Beaver Dam State Park and had Kyle, Jenni and Staley out for dinner at the rig. Ken did his usual great job with grilled Salmon, cabbage and our attempt at replicating the grilled corn/black bean/pepper combination that we loved at the Saathoff Café. 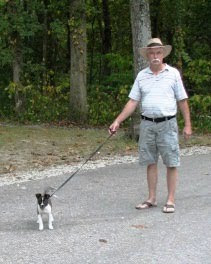 ‘Grandpa’ Kenny also took some time to give Staley some leash training. while we had breakfast in their restaurant that overlooks the lake. 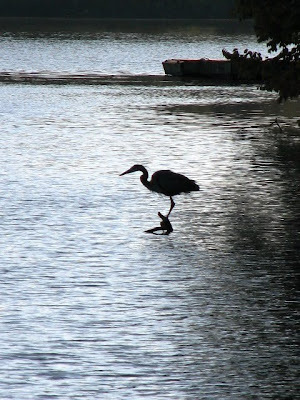 We were able to watch a Heron hunt for his morning fish while I had my oatmeal and Ken indulged in the ‘big breakfast’. (Living 24/7 with a guy who can consume unlimited calories and still stay skinny—doesn’t make it easy on my waistline). Ken hates anything close to city traffic but was a bit hesitant to do the 2-lanes along the river because, despite having been reviewed as the top GPS for RVers, our ‘CoPilot’ software does not give us overpass clearances and he was worries about that on roads smaller than US highways. We took I-255 to avoid St. Louis traffic and then came down I-55 on the Missouri side of the Mississippi. We were communicating with Trevor off and on during the trip and were glad to find out that MRI showed ‘maybe’ a slight labrum tear but that doctors felt it was not something that would require surgery and that with restricted practices, a tight shoulder brace, a limited playing time, he should be able to get back on the field for the SEMO game. What really had him torqued what that because of this they had taken away his starting spot for the game. 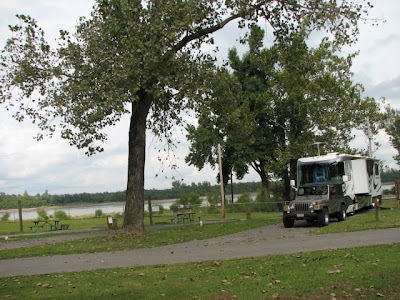 Because Ken’s brother Alan and his wife Nancy were going to travel over from Springfield, MO and camp with us, we made reservations at Trail of Tears State Park where we’d stayed before and had good experience. 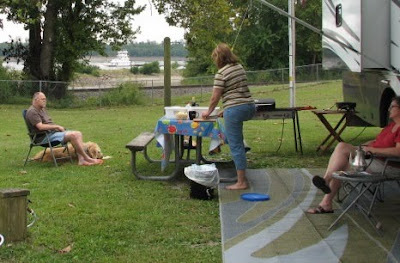 As last time, our sites had great views of the Mississippi River. What we hadn’t remembered was just how close we were to the train tracks that run between the river and the campground. The first night we counted 4 trains while we were trying to sleep. I thought Ken was sleeping but after a Northbound train sounded like it was about to come through our bedroom, Ken simply turned over, smiled at me and said ‘Missed’!! Ken made blueberry pancakes for breakfast and then I prepared his famous Italian Sausage Soup for afternoon tailgating. 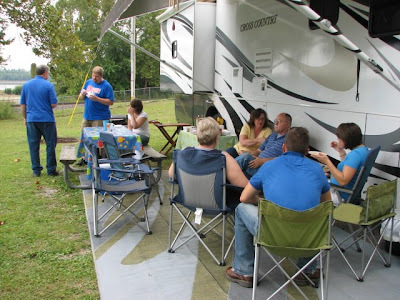 By mid-afternoon we had a full-fledged tailgate party going on with Ken’s brother David and his wife, Cindy, arriving from St. Louis, out niece Erin and her husband Casey coming down from Carbondale, IL, and, of course, Kyle and Jenni driving down from Carlinville. 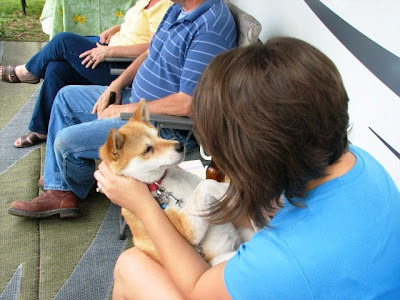 Sox, as usual, got more than her fair share of attention from Erin. A few hours before 6pm game time we piled in to vehicles and made the 10 mile drive in to Houck Stadium. After enjoying a little more Panther Club tailgating hospitality at the tent outside the gates, we went through the routine of picking up our tickets. 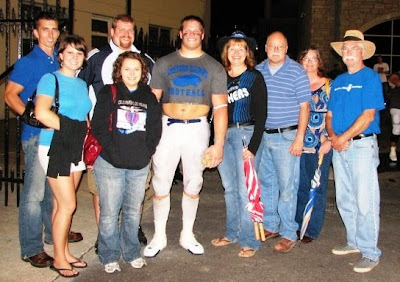 Trevor was able to get everyone ‘player tickets’ since many players did not have family members travelling to this game. 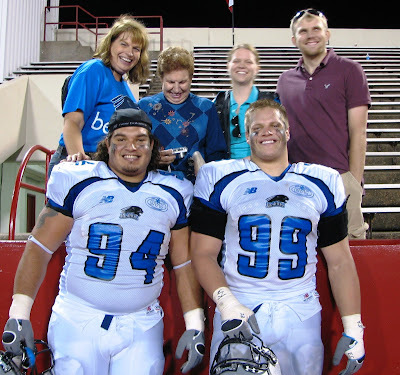 Thanks to all Trev’s teammates who ‘hosted’ his family members this game! 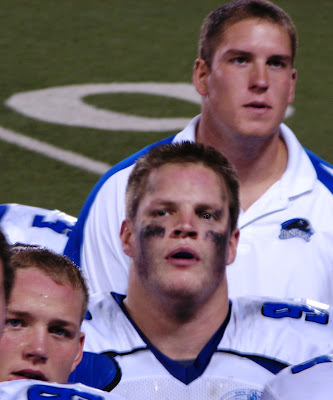 Our seats were directly behind our defensive line bench. Kyle and Ken were really in to this since they could pick up a lot of what the coaches were telling the guys during the game. The game was actually much closer than it should have been. While we won 23-14, our offense turned over the ball 4 times on fumbles inside the 25 yard line. That is not something that will win us an OVC championship. Trevor played most of the game so apparently the ‘restricted playing’ time sort of went out the window when the game was unexpectedly close. He had 6 tackles with one 3 yard tackle for loss. The guys came over to sing their victory song to their travelling fans after the game. After the game, Cindy and David needed to head out for their trip back to St. Louis but the rest of us stayed around to visit with Trevor. By the time he came back out he already had removed the shoulder pads and brace since it was so tight it was really restricting his breathing and movement. That certainly wasn’t evident by the way he played on the field but he attributes that to adrenaline. We decided to get a late dinner and so with two vehicles both with Tom-Tom’s pointed to the nearest Cracker Barrel we wove our way through Cape Girardeau. Kyle, Jenni, Erin and Casey got totally lost but seemed to have a great time on the journey anyway! At about 10:30pm we left Cracker Barrel with Erin and Casey heading back to Carbondale and Alan, Nancy, Kyle, Jenni, Ken and I headed back to Trail of Tears in Alan’s truck. Trail of Tears is ‘closed’ after 10pm so Ken had gotten the gate access codes so we could come in after hours. Everyone was zonked by the time we got to the RV’s and quickly tucked in for the night. Ken made breakfast for everyone the next morning. By early afternoon everyone was on their way and we were back to having the campground almost all to ourselves with Kyle and Jenni headed to the Cardinals vs. Cubs game in St. Louis and Alan and Nancy on their way to Quincy for some more family visiting. Stay tuned…we are now travelling to Clarksville, TN, where the EIU team will be looking to extend their record to 4-0 against Austin Peay. Thursday evening we hosted eight of the players for dinner. I cooked up a pot of chili, sloppy joes, and of course, nachos. Since they are now having team meals on Friday night (which we think is an excellent idea by-the-way), we had to move to Thursday. Having them wolf down several bowls of chili is ok, too, when its not the night before the game!! Annie and Karl Rudert joined us. We joked that if you are going to get these linemen together anywhere you better include the team doctor! Of course, as a team ‘Mom’ I don’t find it so funny that the lineman seem to be the ones the most beat up after a game since they are getting hit hard every single play. Annie contributed lots of plates of cookies and rice krispie treats which were a really big hit with the guys scrambling to take home the leftovers. These guys are so appreciative of homecooked goodies. My favorite part of the evening proved that maybe these guys aren’t quite as tough in everyday life as they are on the field. 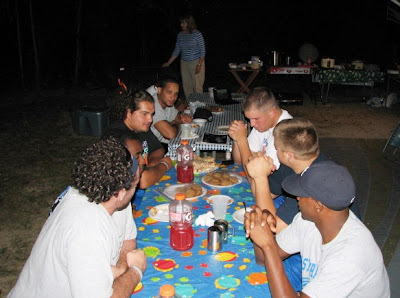 With the sun down and the meals finished, the guys were being pretty boisterous around the picnic tables telling stories on one another. Suddenly one of our regular neighborhood coyotes decided to give out a load singular howl from the wooded area behind the motorhome. You talk about move!! Those guys were suddenly all piled on top of one another as far from the woods as possible. The Florida boys suddenly seemed to be having second thoughts about being ‘out in the wilderness’! They move that fast on the field and they’ll have an OVC championship for sure!! It was the opening night for NFL so the guys came in to watch the game. You really get a different perspective on the game when sitting in a room of football players. 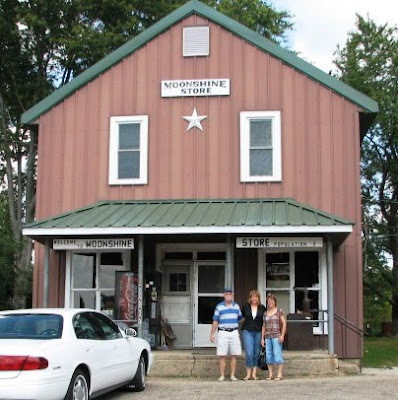 On Friday, Karl and Annie invited us for a ride with them to visit the unique Moonshine Store to enjoy one of their famous lunchtime burgers. They had picked up on our love of getting to know the unique ‘flavors’ of the country as we travelled and this definitely fit our idea of the kind of place we love to search out in our travels. 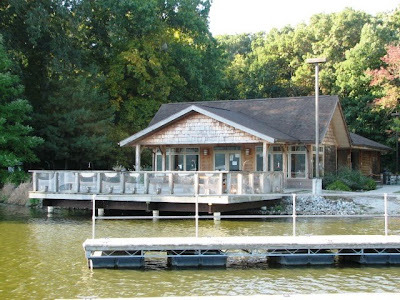 In fact, some of you may have already been acquainted with this place from CBS Sunday Morning. You can see that clip here. It's really good that Karl drove us there since they don’t exactly have easy signage to follow! 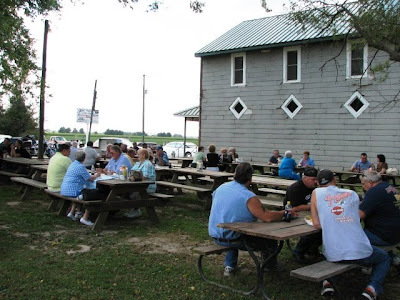 Despite being located in the middle of nowhere, and only serving lunch, this place has at least twice in the past year served over 1000 burgers in a single day! 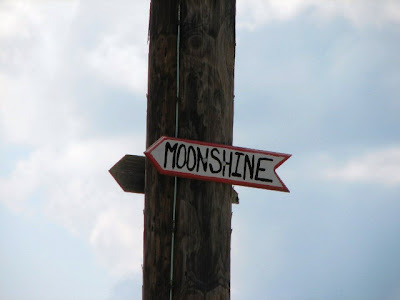 Apparently Moonshine, population 2, is now a favorite destination for motorcycle clubs and other folks like ourselves who enjoy finding such unique roadside attractions. There’s no place to sit in the store but even on a weekday afternoon there were plenty of customers scattered amongst the picnic tables next to the store. It’s pretty much on the ‘honor system’. You give them your name and the number of burgers you want and then just pick up drinks, chips, etc., to take out to the tables. When you’ve gotten your fill you go in and leave the money at the counter. 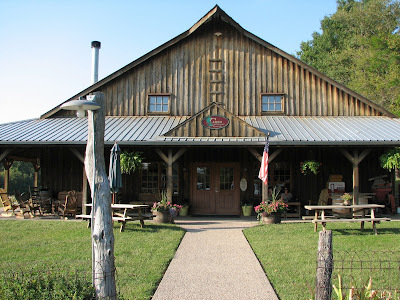 Although Annie had to get back to their place for a vet appointment for her horses, they suggested that Ken and I also check our the covered bridge and the winery in Greenup, IL. Since we didn’t plan to be back in the Charleston area until next month, Ken and I decided to continue our Thursday explorations. We have mentioned Greenup in prior posts. 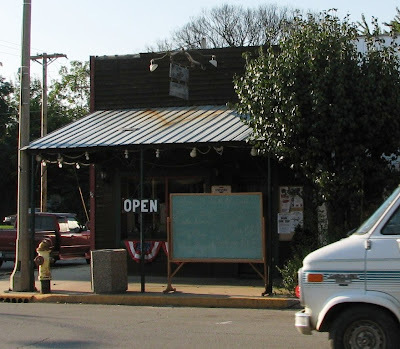 While Charleston is 7 miles to the north of Fox Ridge State Park, Greenup is an equal 7 miles south of the park. It’s claim to fame is being the ‘Town of Porches’. 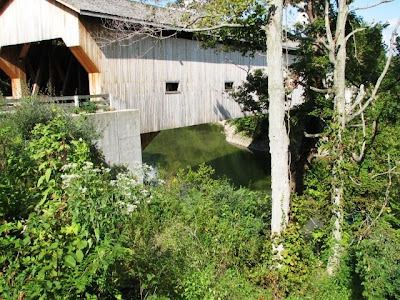 While Ken and I had driven through Greenup before and tried one of the local cafes, we now followed the Ruderts’ suggestions and checked out the covered bridge. 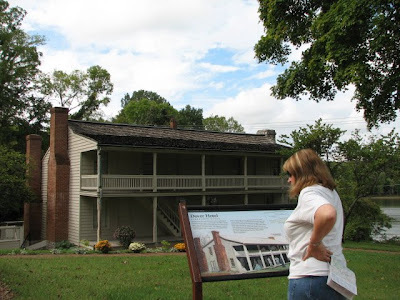 This bridge site has a very interesting history with the story including that Abe Lincoln and his dad took part in building the prior covered bridge that stood at this site. The current bridge was constructed in 1996. 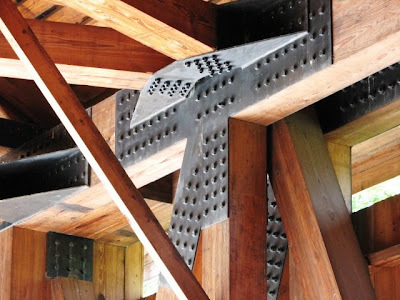 There is enough lumber in this one bridge to build 20 2000 square foot houses. 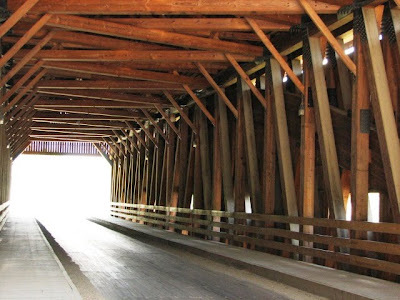 It is currently the longest covered bridge currently in use in the U.S. 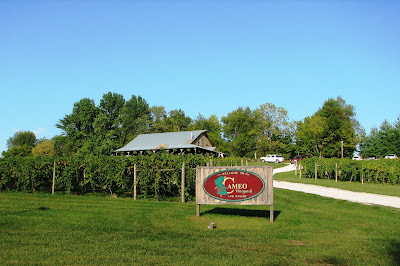 Within a mile of the bridge is the Cameo Winery, which is now our new favorite Illinois Winery. The lady doing the serving is one of the owners and did a great job of walking us through the variety of wines they offered. 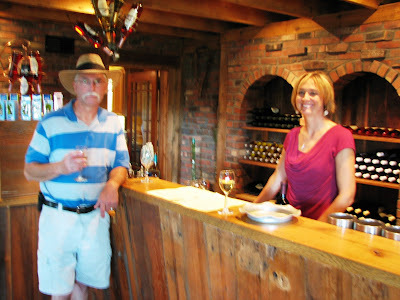 She filled us in on the history of how her husband got in to winemaking and how their operation was set up. She also has a son playing junior high football and spent a lot of time talking to us about how tough it is for a Mom to watch her son play football. I had to admit to her that I have the same problem and that it certainly doesn’t get any easier as they get older since the hits just get harder. Besides great hospitality, we found both a red and a white that we really liked. We decided to sit and enjoy a couple of glasses and then bought a couple of bottles to take back with us. It seems the winery is the Friday afternoon gathering place for local teachers so we had a lot of company. It was dinnertime as we made our way back through the center of Greenup so we decided to try another of their local cafes. Saathoff’s Café is a very small corner café with a blackboard out front announcing the days specials and maybe seating for 24 if you include the bar stools. 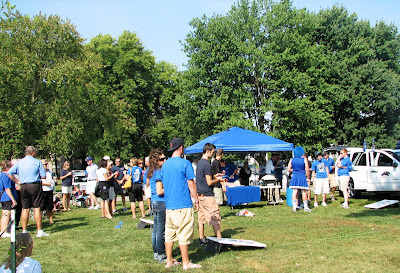 However, we sensed we’d picked a winner as soon as we walked in and saw an EIU Panther flag flying and an EIU football poster/schedule prominently displayed. And the menu was a welcome surprise. Not your normal café menu, there were separately priced entrees and sides, with local specialties such as the chefs own homegrown garden items featured. Ken had the ribeye and I had a special pork dish. They were great but the standout item was a grilled corn side dish with peppers, and black beans, sautéed in butter. We are definitely going to experiment at home to try to replicate. The owner/chef, Michael, came out to talk. He does a lot of catering and had served the Chicago Bear’s during training camp. 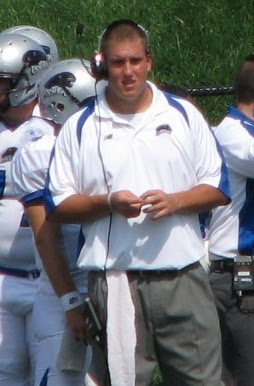 He had been negotiating with the EIU football admin for their new Friday night meals for the team but apparently they couldn’t come to terms. Too bad, the boys would have loved this guys cooking. Ken had said the café was in the perfect location since it was right across from the old fashioned ice cream soda shop (for dessert). But, the meal was so great that we had no interest in trying out the ice cream shop after. We can save that for next visit, especially since we needed to make it an early night to head out for the game on Saturday. Saturday morning we didn’t get on the road until 8:45am. This should not have been an issue since we had a backroad route to Terre Haute that only required about 45 minutes and the game was at 11:00. Problem was that when we got to the city we found that there were no less that 4 different ‘3rd Streets’ in the area and we never could find the ‘Lafayette’ street that Googlemaps had in our directions. 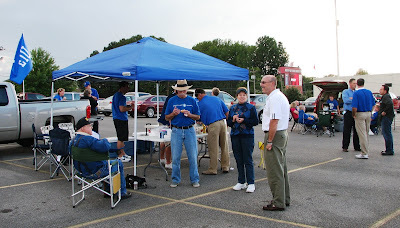 We didn’t arrive until about 10:00 but still were able to get in a little tailgating with the Panther Club. Unfortunately, I think Trevor’s friend Avery was finding better competition on the bags game at the tailgate than what we faced inside the stadium. 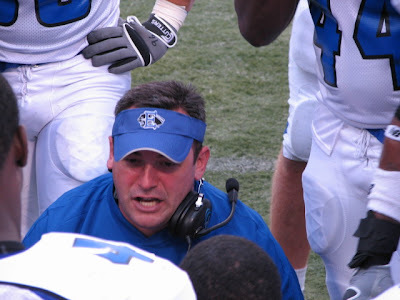 Indiana State has not won a game in 3 seasons. 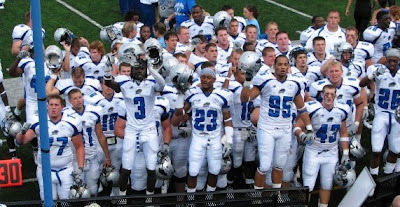 It was the EIU defensive unit's goal to keep them scoreless and they met that goal with a 31-0 win. Unfortunately, even with this lopsided score it was not a very good showing offensively with lots of stupid penalties and 4 sacks. Kevin Mahoney, having been moved to the Offense coaching staff and off the field after his eighth concussion, looks to be turning up his nose here at what he’s seeing on the field. Shoot – looks like the cheerleaders weren’t at their best for this game either – or at least they needed a shave! 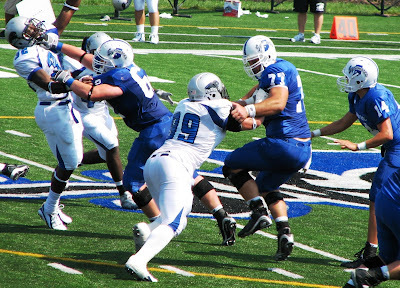 For the time that he was in, Trevor made a really good showing defensively with several tackles for loss and a sack. It appears here that if he couldn’t get to the quarterback himself, he’d simply throw the O-lineman at him!! 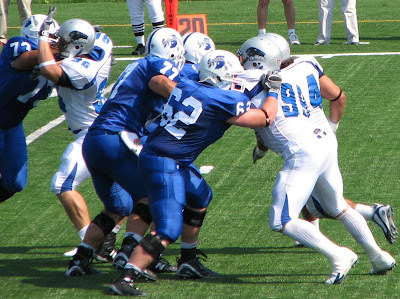 You can see here an example of the impact on Trev’s shoulders when he and Andre have a 1000 lbs of linemen coming at the two of them every play. With the lopsided score, Trev spent the 2nd half of the game on the bench watching the second string get lots of playing time. This was probably a good thing.For those of you that have been following, yes, Trevor is favoring his left arm in this picture. The guys were glad to put win#2 under their belt and came over to the stands to sing us their victory song before leaving the field. We talked to Doc Rudert briefly and to Trevor after the game. I can’t hardly believe I’m writing this but he has now sublexed his left shoulder. It was his right shoulder that a specialist had to put back together surgically so this is certainly a big worry. The left shoulder had a lot of swelling but was back in place. The hope is that with several days rest Trev will be ok for the SEMO game next weekend. One Day Until Opening Game! !